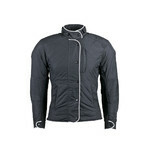 Jacket with detachable waterproof membrane and thermal liner, ventilation system, straps for size adjustment. 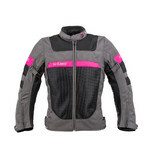 The Women’s Motorcycle Jacket Ozone Delta IV Lady is a high-quality polyester motorcycle jacket. CE elbow and shoulder protectors improve the safety of the rider. Moreover, the back pocket allows you to also use a back protector. The detachable, breathable waterproof membrane will keep you dry while the thermal liner (which is also detachable) will keep you comfortable. 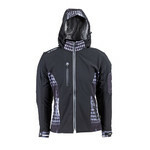 The soft and breathable mesh liner wicks sweat away from the skin, allowing the air to circulate. The sophisticated ventilation system will keep you well ventilated while the 4 practical pockets offer enough storage space for all your necessities. You can adjust the size of the jacket using tightening straps. The reflective components improve the visibility of the rider in low light conditions. 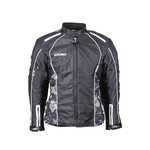 It is essential for motorcycle clothing materials to be durable, permeable and wind and water resistant. The Reissa membrane is permeable and at the same time waterproof. It is made of polyurethane, a hydrophilic material that holds in water but not vapour. The Cordura material is extremely resistant to scratching and durable, even though it's very light. As a protection against cuts, Kevlar is 5x more effective than leather and 2x more effective than polyamide or cotton. Cotton is distinguished by great sweat absorption and thremoregulation properties. A special type of cotton fabric is denim, specific for its blue colour. It is durable and wear resistant. A very popular material among motorcyclists is leather, prized for its thermoregulation properties and wind resistance. The disadvantage of leather moto clothing is that it often doesn't include many protectors. Synthetic fibres, such as polyester, polyamide or nylon are non-absorption materials that absorb very little moisture and are resistant to scratching and tearing.